2920 kilometers raced at an average speed of 27.29 km/hr. 166 starters and 99 classified finishers. 14 stages, giving an average stage length of 209 km. 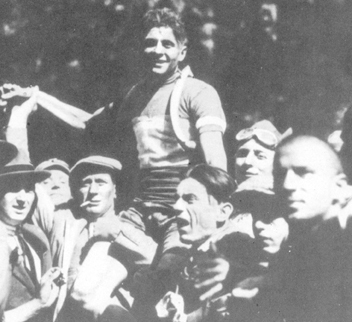 Alfredo Binda so dominated the 1929 Giro that when the race finished in Milan, he was booed by some in the crowd. Binda won eight consecutive stages, still the Giro record. This was Binda's third consecutive Giro win and fourth overall. This was the Giro's second time to start outside of Milan and the first edition to have an extended visit to southern Italy. The organizers designed a fourteen-stage race covering 2,920 kilometers in 1929. That made the average stage only 209 kilometers. The 1929 peloton was about half as large as the 1928 pack, numbering only 166 at the start. 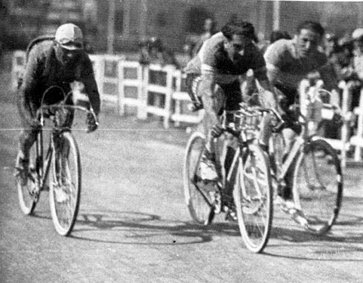 Given that 99 riders made it to Milan in 1929, it appeared that Giro management had done a better job of selecting riders who could withstand the rigors of a three week race. 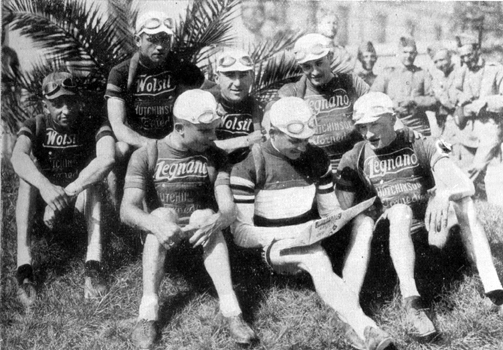 The 1929 edition was seen, quite reasonably, to have Binda as the odds-on favorite against the rest of Italy’s finest: Belloni, Piemontesi, Pancera and Antonio Negrini. There were two new entrants whose gifts had not fully matured, but would put their mark on the Giro in later editions, Raffaele Di Paco and Learco Guerra. Spring competition gave the pretenders reason to believe that they were in for another caning by the Trumpeter. Binda masterfully won Milan–San Remo, cruising across the finish line with over eight minutes to spare. Both Milan–San Remo and the Giro were Italian contests that year, with only two foreign finishers in Milan–San Remo and none in the Giro. For only the second time Giro started not in Milan, but in Rome, the other occasion being the 1911 celebration of the unification of Italy. The first stage was 235 kilometers from Rome to Naples. The evergreen Belloni, who had by now been a professional racer for fourteen years, won the ten-man sprint. Right with him were Negrini, Piemontesi, Binda and Pancera. Gaetano Belloni wins stage 1. For the first time, the race went into southern Italy for an extended visit. Stages one through eight were held in Lazio and regions further south. Stage two left Naples and crossed over the Apennines to Foggia. Binda took the win in a seventeen-man sprint. Since Belloni had received a one-minute bonus for winning the first stage he remained the leader. After the third stage, also won by Binda, records differ as to who was the leader. Some say Belloni, while one says Binda by “one-quarter wheel length”. The southern experiment made for an extremely difficult race. At the end of the 1920s, most of the roads in Italy’s deep south were still unpaved. The race was plagued with loose animals, difficulty in finding lodging, scarce gasoline for the cars and even trouble getting safe water for the riders. Stage four went through the rugged countryside of Puglia and Basilicata and was Belloni’s undoing where he lost over six minutes. The lead was now inarguably Binda’s. Binda kept on winning stages, eight in a row in fact, from the second to the ninth stage. To this day, eight consecutive stage victories remains the Giro record. As the race progressed, Belloni continued to lose time. His fifth stage (Potenza–Cosenza) loss of almost an hour meant the end of any hopes of a high placing for “The Eternal Second”. Amazingly, in the eighth stage his luck managed to get even worse. He crashed and lost fourteen minutes before he was able to remount, and give what must have been a desperate chase to regain the field. While he was climbing the hill into Ferentino, a town southeast of Rome, a young boy darted in front of the pack at a bend in the road. Belloni ran right into him, killing the boy. Belloni was distraught. Overwhelmed by the tragedy, he climbed off his bike and wept. He abandoned the Giro and eventually a car took him back to Rome. The winning Legnano team. Italian champion Alfredo Binda reads the paper. From Orvieto the race headed towards Milan. Binda didn’t win any of the next three stages but he was always in the top three, careful not to lose any time. Piemontesi, also an alert and careful rider, stayed close to Binda. When Binda and Piemontesi broke away in the twelfth stage, leaving Frascarelli 94 seconds behind, Piemontesi was able to move up to second place. Binda took the thirteenth stage, but it wasn’t his to keep. The judges ruled that the first four across the line; Binda, Piemontesi, Negrini and Alfredo Dinale, had not sprinted fairly and the fifth rider, Mario Bianchi, was given the stage. Binda did come in second in the final stage to Milan, thus sealing his fourth Giro and in doing so, had taken nine (OK, eight) out of fourteen stages. Binda’s win brought some pain to the great rider. When the Giro ended at the Arena stadium in Milan, Binda was booed by race fans tiring of his hegemony. Binda had been the subject of abuse before, but he was deeply shaken by the crowd’s reaction. He retired to the Legnano team van to cry in private. La Gazzetta said that his “crime” was being superior to all the other riders in the race. Writers of the time spoke of Binda’s tyrannical hold on the race. It was true. There were no riders of Binda’s class racing in Italy in 1929. Not everybody was unhappy with Binda's victory. We all like our sports’ outcomes to be determined by grit and athletic ability. Stage racing is such a complex and expensive endeavor that there is a tendency for the best-sponsored rider to have a large advantage. The Giri of the era gave the richer riders another advantage. For an extra sum, the organizers would provide superior food for them at the feed stations. Through the second half of the 1920s, Mussolini consolidated his power. He was able to take advantage of a collapse of the liberal and leftist parties and ban all political parties except the Fascists. He instituted some economic reforms, but when he tried to touch the power of the giant landowners of the south, he had to back off. They were a law unto themselves and even Il Duce couldn’t touch them. Thus, the promised reform and prosperity for the south did not happen under Mussolini, and the region sank into even deeper poverty. Mussolini’s desire to create a totalitarian state in which the government controlled all aspects of the Italian citizens’ lives caused the Fascists to embrace sports, and cycling was one activity the regime particularly encouraged. Furthering the government’s marriage to sport, the Italian Olympic Committee (CONI) was made part of the Fascist Party in 1927. We have seen Mussolini offer prizes in his name to the Giro racers. Historian Christopher Duggan believes the Fascist emphasis on sports and competition in the decades before the Second World War had a lot to do with making them the integral part of Italian life that they are today.